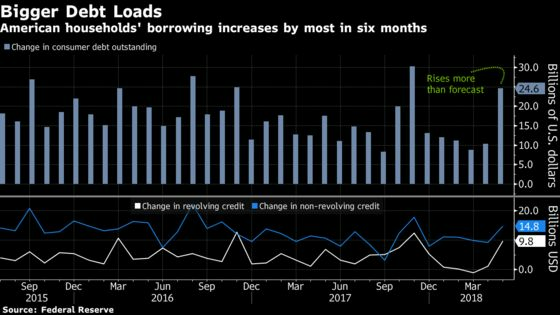 (Bloomberg) -- U.S. consumer debt rose in May by the most in six months on more credit-card debt outstanding and non-revolving loans, Federal Reserve figures showed Monday. The increase in revolving debt, which includes credit cards, shows consumers were spending more freely midway through the second quarter. After slowing in March to recoup from a debt- laden fourth-quarter, households picked up the pace of credit in consecutive months. The rise in non-revolving debt, which includes educational and auto loans, partly reflects steady motor-vehicle sales. The Fed’s consumer credit report doesn’t track debt secured by real estate, such as home equity lines of credit and home mortgages. The results signal a modest acceleration for second-quarter spending amid recent tax cuts and a robust labor market. Still, moderate wage gains may encourage households to be more conscious about taking on too much debt.